Micro-Mechanics (Holdings) Ltd - A 60%-margin, 30%-ROE consumables business with a 15-year earnings CAGR of 20%. Expect strong earnings momentum from current surge in semiconductor industry sales. Initiate coverage with a BUY rating and SGD2.00 target price, implying a 35% upside plus dividends. Micro-Mechanics (MMH) produces consumable tools and parts used in the back-end semiconductor process, in particular, die attach and wire bonding. These include rubber tips that pick up tiny bare semiconductors (called dies) that have been cut from a wafer and then placed onto a metal pad (called leadframe that connects to outside world or circuit board). This die will then be encapsulated into the ubiquitous semiconductor chips we see everywhere. Another major product are tools used in the wire-bonding process. An example is a clamp to hold the lead frame during the wire-bonding process of the die. It is also building up capabilities to serve the front-end of the semiconductor industry through its US operations. We do not expect this to contribute materially to earnings in the near term. MMH has a dividend policy of not less than 40% of earnings. Dividend yield is presently at 5.2%. Enviable track record. MMH has an impressive 15-year track record of growing earnings by 20% CAGR. This has been accomplished together with strong operating cash-flows and an unlevered balance sheet. ROE has averaged 27% over the past three years. We expect ROE to cross 30% this year as earning accelerate. High margins from intellectual property and execution. MMH enjoys huge gross margins of almost 60%. This is the highest amongst its listed global peers in semiconductor back-end supply chain. We believe its high margins is a culmination of its intellectual property in material science and strong execution in customising products which require extreme micrometre precision. Strong semiconductor growth. MMH Jun 17 quarter earnings jumped by 60% YoY. The momentum looks sustainable as recent semiconductor industry sales remain robust. We initiate MMH with a BUY and a target price of S$2.00, 35% upside including dividends. Our target price pegs MMH at 15x PE FY/18e, which is in-line with peers in the back-end semiconductor supply chain. We believe this is conservative given its superior margins, ROE and dividend yield. 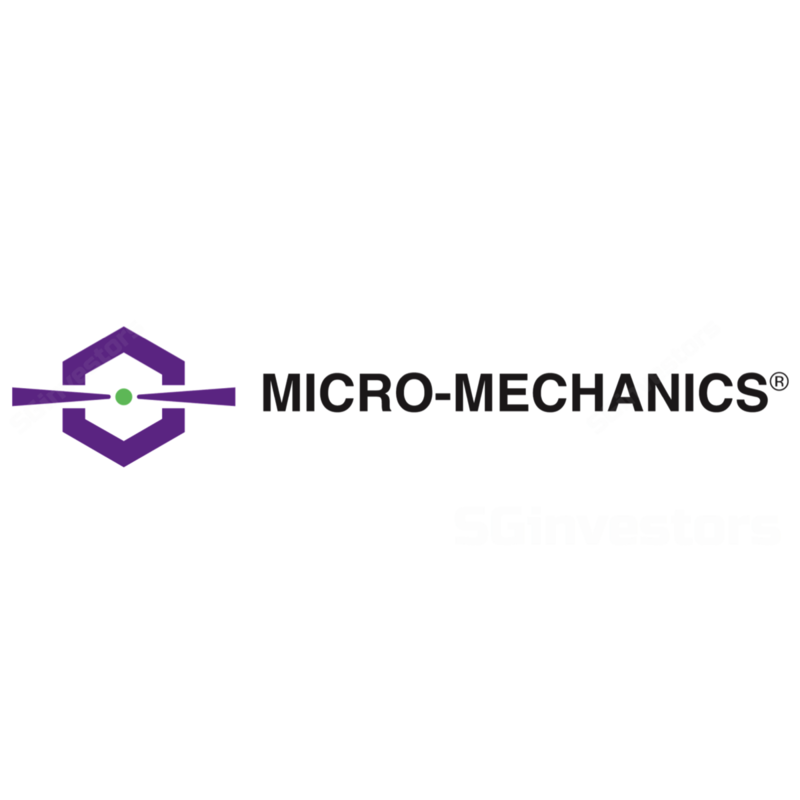 Micro-Mechanics (MMH) was founded by Mr Christopher Borch in 1983. It was listed in June 2003. In its 14 years since listing, revenues have more than tripled and earnings have increased five-fold. During this time, the company has also returned more than S$70m in dividends. MMH manufactures precision tools and consumable products for the semiconductor industry. Core products manufactured are used in the die attach and wire bond process of the assembly and testing stage. It is also building up capabilities to serve the front-end of the semiconductor industry through its US operations. MMH has five manufacturing facilities in Singapore (1983), Malaysia (1989), Philippines (1998), China (2004) and USA (2008). Also worth mentioning MMH is ranked 19th out of 606 companies on SGX in terms of Singapore Governance and Transparency Index. MMH produces consumable tools and parts used in two steps of the back-end semiconductor process, in particular, die attach and wire bonding. In addition, MMH has made the strategic step to produce tools and parts for the wafer fabrication equipment industry from its US factory. Rubber/plastic tips and pick-up tools: To pick up the die from the wafer and place them onto the leadframe. The size of these tips can be less than 10mm. Die ejector needles: To separate the die by pushing it out from the wafer to allow for pick-up. Dispensing nozzles: To dispense epoxy/adhesive onto the leadframe before the die is placed on the epoxy. Wire bond clamps: Top plate and lower heater plate which hold the leadframe down during the ball bonding process which uses gold/copper wire. Parts and tools used in critical wafer-fabrication processes: Customers are the front end semiconductor equipment makers. Tools produced are used in the vapour desposition and etch machine. The revenue generated in this division comes from the US manufacturing facility. US operations have been loss-making, but in FY17 the losses have narrowed considerably. MMH embarked on the strategy to penetrate front-end semiconductor industry (and laser, medical, aerospace) following the acquisition of Advanced Machine Programming in May 2008 for S$2.5mn. Since FY09, US operations have been suffering accumulated losses totalling S$12mn. In FY16, MMH redefined its business strategy to focus on manufacturing process-critical parts and tools for the front-end semiconductor industry. To enjoy manufacturing gross margins of 60% and 40% EBITDA margins, we believe it is due to the tremendous complexity and technology required in producing these tiny little parts which the limit competition. Increased miniaturization: With miniaturization of electronic products and semiconductors, we have seen a dramatic shrinkage of die sizes. Dies sizes are now as small as 1mm2 to 10mm2 depending on the application. Not only is the size of the die shrinking but the thickness of the die is collapsing from 60 microns to less than 20 microns (i.e. 0.02mm). Complex material engineering: The material used in producing the rubber tips require a significant amount of R&D. Materials must avoid electrostatic discharge (ESG) that can burn the semiconductor chip. These materials used must be purified to avoid chemical or organic contamination. The material composition of these tools is proprietary developed by MMH. Need for customization: An interesting “quirk” about MMH tools and consumables is the level of customization. Every customer will require some level of customization for their tools despite some using the same die attach or wire bonding machine. Customers look for fast turnaround times for the tools they require. This customization we believe creates an additional barrier and even exclusivity. Such customization is highly complex due to the quick turnaround time (as short as 6 days). It also means customers prefer to work with a single source or supplier to save cost, in our opinion. Die placement and rotation accuracy – The accuracy in placing the die now encroaching the 3 micrometres or micron*. There is little tolerance for error in positioning these dies. Delicate material – Due to the size and fragility of the die, it can be easily contaminated, cracked or scratch. Stability – Due to the high volume and automated process in die attach, it requires the highest quality and reliability of the tools. What we find most attractive about MMH? MMH gross margins have averaged 55% over the past five years. The most recent quarter margin expanded to almost 60%. MMH has consistently enjoyed high gross margins. Only in the 2009 global financial crises, gross margins suffered and even then, margins bottomed out at 40%. When we compare MMH margins, against other parts of the back-end eco-system, MMH margins stand as the highest and is easily double of the industry average. As mentioned earlier, the high margins are a result of the complexity in manufacturing the product, high efficiency (24/7 automated machining), extensive customization and quick turnaround time demanded by customers (as short as 6 days). When we look at MMH 15-year history, the track record is impressive. Over the past 15 years, revenue has compounded almost 10% per year. Profits have performed even better, compounding at 20%. It seems that MMH’s growth is accelerating. The 5-year track record for earnings is now 28% CAGR. MMH has a dividend policy of not less than 40% of earnings. MMH has no leverage on its balance sheet. The company is in a net cash position of $22m. In its 15 years track record, MMH has always been in net cash position due to the positive cash-flow generated every year. Despite its large cash holdings, MMH posted unlevered ROE of 28% in FY17. Another strength of MMH products is the consumable feature of the tools. In general, some of the tools, in particular higher-end semiconductors, need to be replaced every 8-hour shift by the customer. This is to contain contamination and ensure precision of the process. This means the demand for the product is more recurrent and depend on the output of semiconductor rather than on lumpy capital expenditure cycles. The key driver for MMH growth will be increased sophistication of packages and unit growth of semiconductors. It is hard to compute the exact impact of advanced chip packages on demand. But we can use semiconductor unit growth to have a good gauge for demand, especially due to the consumable nature of MMH products. Demand for semiconductors is expected to grow 9% per year on a per unit basis from 2016 till 2021, according to Gartner. As semiconductor packages evolve, the requirement for the pick and placing of dies becomes ever more critical. Wafer Level packaging such as Fan Out packaging process will require die attach process during the wafer reconstruction phase. Dies still need to be picked from the wafer and placed on a separate metal carrier for moulding. NAND memory dies continues to be stacked, as much as 32x on top of each other in a single package. Flip chip process requires an even higher accuracy than standard epoxy die. The bumps on the die have aligned to the bond pads on the substrate. Flip chip demands two tools, the first to lift bumped die and another tool to flip it over. Wafer fabs which are involved in front-end wafer production stage and also undertake some back-end processes such as TSMC, Intel and Samsung. The earnings model for MMH is straightforward in terms of margins and capital expenditure. Most challenging will be the initial step to forecast revenue. Step 1: We tracked how MMH revenue compares to global semiconductor industry revenues. MMH revenue has a close correlation (+0.9 correlation coefficient) with semiconductor industry revenues. Semiconductor sales have been robust in 2017 and the pace of growth is accelerating. Latest July 2017 semiconductor sales growth was 24%, fastest pace of growth in almost 7 years. Step 2: We use the estimated 9% unit* growth of semiconductors as our base forecast and an additional 2-3% points incremental growth due to the increased number of dies being stacked or condensed into every semiconductor chip. However, the current spike in semiconductor sales provides upside surprise to our forecast in the near term. Our target price for MMH is 15x PE 1-year forward. Valuations for back-end supply chain is between 16-17x. We base our valuations off the back-end semiconductor supply chain. We believe the valuation is conservative given MMH superior margins, ROE and dividend yield. MMH EBITDA margins of 40% is the highest and more than double the various players in back-end supply chain. In terms of dividend yield, MMH also ranks the highest in the supply chain. When comparing ROE, only BE Semiconductor and Inari are higher. But valuations of both companies are much steeper at 16-19x forward PE and more than 5x P/BV.